Kerala Governor and former Chief Justice of India P Sathasivam on Monday said lawyers have to be vigilant, especially in maintaining credibility. “As a person who was fortunate to lead the Indian Judiciary, I am worried about the reports about unqualified lawyers in our State and the nation. We have been hearing reports quoting official sources that thousands of lawyers in Kerala are yet to confirm their educational credentials. Even an allegation in this regard is very depressing and it is high time Lawyers' Associations came forward to clear the misunderstanding caused in society,” he said. 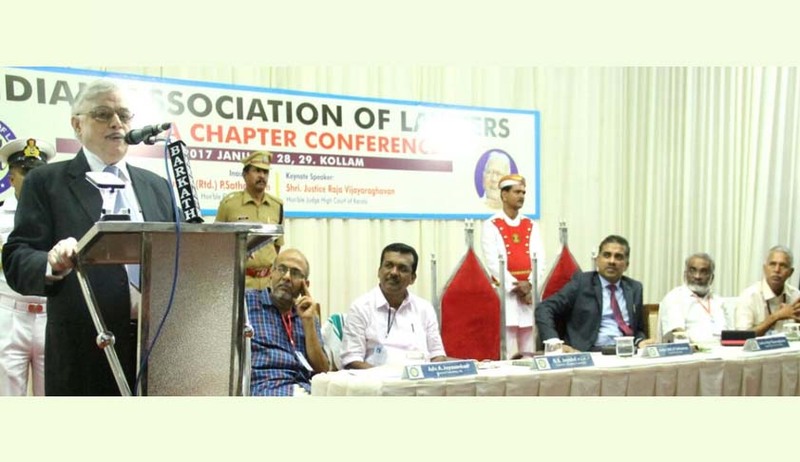 Justice Sathasivam was delivering the inaugural address in the Kerala Chapter Conference of Indian Association of Lawyers. Speaking on the occasion Justice Raja Vijayaraghavan, Judge, High Court of Kerala said lawyers have played a very cardinal and important part in working out the terms and equations of justice between the citizen and citizen and between the citizen and the state. It gives me great pleasure to inaugurate the Kerala Chapter Conference of the Indian Association of Lawyers. In my present official capacity, I get only a few opportunities to interact with the legal fraternity, to which I have always belonged. I still cherish my days as a lawyer and therefore, addressing lawyers is like going back in time, feeling younger. I understand that the focus of this conference is, 'Lawyers are for Democracy'. This assertion points to the role of a Lawyer in society, one that involves the lawyer's conduct, professional acumen, expertise, responsibilities and many other aspects. A Lawyer's role is in ensuring justice to people. It is this justice that ensures people's freedom and makes them capable of participating in the democratic process. The Lawyers also have a key role in maintaining the image of the judiciary. With such a significant role to play in society, a Lawyer has to be vigilant, especially in maintaining credibility. As a person who was fortunate to lead the Indian Judiciary, I am worried about the reports about unqualified lawyers in our State and the nation. We have been hearing reports quoting official sources that thousands of Lawyers in Kerala are yet to confirm their educational credentials. Even an allegation in this regard, is very depressing and it is high time Lawyers' Associations came forward to clear the misunderstanding caused in society. A lawyer needs to cultivate a harmonious blending of the fundamental qualities of talent, technique and temperament. Talent also includes language skills, which should manifest as the skill of advocacy, which can be cultivated only through good reading. The skill of advocacy should not be limited to one's performance in the courtroom. In fact, a lawyer is bound to take maximum efforts to avoid litigation as much as possible. I am reminded of Abraham Lincoln who preferred to discourage litigation and believed that “as a peacemaker, the lawyer has superior opportunity of being a good man and there will still be business enough”. I am certain that all of you are aware of the avenues for Alternative Dispute Resolution, which can be invoked at any time, even if the matter is pending in the Court of Law. The disputes can be resolved more economically and speedily and it can reduce the workload of the court through a flexible procedure. Cases under the Motor Vehicles Act, 1988, the Consumer Protection Act, 1986, and the Contract Act, 1872 etc. can be brought under the aegis of obligatory ADR. Similarly, cases involving family law (matrimonial disputes), insurance, compensation, labour disputes should also be brought under the ambit of ADR. Section 89 of the CPC read together with Rules 1–A, 1–B and 1–C of Order X would allow judges to refer disputes for settlement through ADR procedures in cases where elements of settlement are discernible. We should use the provisions of Section 89 as often as possible, since the referral to ADR decreases the caseload and arrears of the court and thus increases the time which can be devoted to other contentious matters. We should also remember the matters about issuing notice and response u/s 80 of CPC, which is a conciliatory step towards settlement. A statutory notice of two months before the proposed action under Section 80 of the Civil Procedure Code 1908, is intended to alert the State to negotiate a just settlement or at least have the courtesy to tell potential outsider why the claim is being resisted. The object is to curtail litigation and the area of dispute. Wherever a notice is issued, the Government or departments or other statutory bodies should send a reply to such a notice and should properly deal with all material points and issues raised in the notice. As we all know, Government of India and State Governments are the largest litigants in India. The State should have a policy of settlement of governmental disputes with citizens in sense of conciliation, rather than in a fighting mood. Indeed, it should empower its law officers to take steps to compromise disputes rather than to continue them in court. We should also be familiar with the Amendments in the Civil Procedure Code of 2002, enacted to reduce the delays, experienced by litigants. In the case of service of summons, now the plaintiff only has to provide the required number of copies of the plaint and to pay the costs of delivery. If this is not done within the stipulated period of 7 days, then the suit shall be dismissed, as per amended Rule 2 of the first schedule of Order IX. Summons may now be delivered through Fax or email also. In cases where the defendant resides outside the jurisdiction of the court, the summons can be sent through courier, approved by the court and not necessarily the high court, as in earlier times. As per amended Rule 1 Sub Rule (i), Order V, the defendant has to submit the written statement within 30 days of the service of summons. This may be extended upon an application to the court, up to a maximum of 90 days, with reasons for granting extension to be recorded in writing. As per amended Order VIII Rule 1, if the defendant fails to file the written statement within the given time the court may pass any order against the erring party or a judgment / decree. This provision would also definitely further the cause of speedy justice. Under Order VI Rule 17, once the hearing is commenced, both the plaintiff and defendant shall not be given leave by the court to amend the suit unless the court decides that in spite of due diligence being exercised the party could not have raised the matter. Oral arguments tend to go on endlessly and now under Rule 2(3A) of Order XVIII, written arguments can be submitted. This is a useful provision, because it offsets any possible injustice owing to the refusal of the court to hear the arguments. Coming to the Criminal Law (Amendment) Act, 2005, the idea of plea bargaining simplifies the formal legal procedure and ensures speedier disposal. Plea bargaining was introduced in India by amendment of the Code of Criminal Procedure starting January 11, 2009. This applies to cases in which the maximum punishment is imprisonment for seven years; however, offences affecting the socio-economic condition of the country and offences committed against a woman or a child below the age of 14 are excluded. Although the Evidence Act has been in force for many years, it has often been amended to acknowledge important developments. Amendments have been made to the Evidence Act to introduce the admissibility of both electronic records and paper-based documents. As a solution to the case-congestion, people suggest temporary measures like reducing the number of court holidays and so on. However, we could try the judicious use of technology to increase the pace of procedures. The High Court of Delhi had launched its paperless court with one of the benches. It was reported that on the first day itself, 33 cases were heard. It is very sad that the most literate State faces an unending conflict between Lawyers and media-persons, both of whom constitute two pillars of democracy. As supporters and protectors of democracy, the legal fraternity should come forward to resolve the issue, which I understand, has worsened to the level of Lawyers refusing to argue cases pertaining to media companies. The judiciary and journalism are society’s two most important watchdogs of democracy. There are many similarities between lawyers and journalists. Both claim to be interested in the pursuit of justice. The relation between law and journalism should be cooperative, not contradictory; complementary, not conflicting. The lawyer is the sworn officer of the court unto society’s welfare; the journalist is the unsworn officer of society unto the common good. Both law and journalism, in their last and final analysis, are professions of public service. There is no other adequate reason for their existence in a social state. I would say that reasonable restrictions in the courts can be understood, but a total non-cooperation and antagonism are not in the spirit of the democratic values that we as lawyers, uphold. It is surprising that Lawyers, who help litigants to reach consensus through ADR and other mediation, are unable to take a lead in settling this issue. Let us not forget that society is watching us. I compliment the Kerala chapter of Indian Association of Lawyers for conducting this conference in a befitting manner. I hope such interactions would help us to improve professionally and to perform our social duties in a manner that benefits the people of our country.